Dashanbao is like a jewel shining on the Wumeng Plateau in the northwestern part of Zhaotong City in China’s Yunnan Provence. Situated approximately 3,000-3,364 meters above sea level with an average annual temperature of 43°F, it is one of the country’s National Nature Reserves. Every spring, summer and autumn, the landscape of Dashanbao is quite spectacular with an abundance of plants and wildflowers. In winter, however, there’s nothing to see except bare hills. Despite its brilliant vistas, for residents of Dashanbao, this township is not the paradise it appears. Poor geography and weather conditions, including frequently low temperatures, limit the types of crops farmers can raise to buckwheat and oats. To survive, the people of Dashanbao must also raise livestock. A curious cow looks on as a sheep tries out the new bathing pool. Dashanbao’s Changhuikou Wetland is one of four reserves created for black-neck cranes. Shao Rongfa raises sheep in one of the villages nearby. Most of his neighbors raise sheep, too. When the sheep are sheared at the start of each summer, farmers frequently find worms in the animals’ wool. And occasionally, a too-close cut causes injury. To protect the livestock from disease caused by pests or open wounds, farmers bathe their sheep with medicated soap twice a year–an arduous, dreaded process. Rongfa came up with a plan that would make the biannual bath time more pleasant for everyone: a community sheep bathing pool. He called a meeting to discuss his plan, but only a few neighbors were interested. Most said they didn’t have enough money to invest in such a project. With no financial backing, Rongfa put his dream on hold. Your gift can make dreams come true for families around the world. 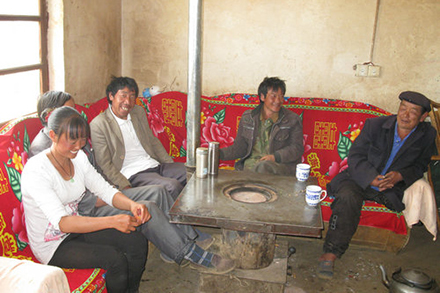 Shao Rongfu (far right) enjoys a lively conversation with fellow sheep farmers. In 2012, Heifer China brought a project to his village. Rongfa joined the project and was chosen by his community to lead a self-help (SHG) group. Within a year, major improvements began happening in the village, and during one SHG meeting, the topic of a communal sheep bathing pool came up. Rongfa described his vision of the pool in detail, and this time, everyone was enthusiastic and eager to make this long-held dream come true. The group agreed that a portion of their collective earnings would be spent to build a pool on a local plateau. This was a convenient location, accessible by the entire village. With the new pool, farmers can bathe their sheep any time they want. Clean sheep are healthy sheep, and healthy sheep contribute significantly to the successful businesses and livelihoods of these farmers. Heifer International continually works to empower project farmers to meet genuine needs and create bright futures for their families. From project to project, these needs are addressed in a variety of ways. For some communities, it is a new road. For others, it may be a drinking well. For Dashanbao sheep farmers, however, it was a pool on a plateau! Previous Article Help Heifer Get to South by Southwest!